The possibility of seeing a 32GB Google Nexus 7 in the coming weeks looks increasingly likely as the new tablet continues to pop up in various places. The device appeared in yet another retailer inventory on Tuesday, and today it's been spotted in a Christmas magazine for major British retailer Argos. What's most interesting is that the device is priced at £199 (approx. 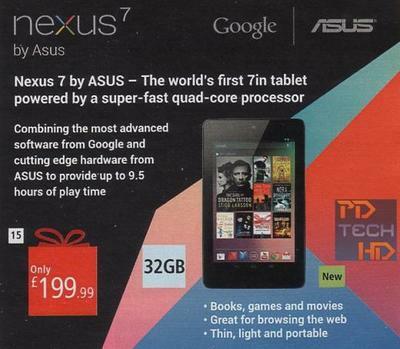 $322) in the advert, pictured above, which is just 99 pence more than the original 16GB Nexus 7. With that being the case, those who have recently purchased the original in the U.K. are going to be pretty disappointed when the 32GB version makes its debut. Argos hasn't provided a specific release date for the device, but according to The Next Web, a representative for the company did say that it would be available nearer the Christmas period, and "not to expect it in the next two weeks." In comparison, the leak from Staples inventory on Tuesday stated the device will launch on October 18 — which suggests it may arrive in the U.S. before the U.K. While we may still be awaiting an official announcement from Google, the 32GB Nexus 7 appears to be all but confirmed. It's popped up so many times in recent weeks that it's now a matter of when, not if the tablet will appear. If you're a 16GB Nexus 7 owner, will you be disappointed when Google launches a 32GB version at the same price?